Click the magazine cover to flip through the current edition. 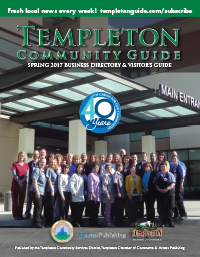 –Access Publishing, in partnership with the Templeton Community Service District and the Templeton Chamber of Commerce, recently completed the spring and summer edition of the Templeton Community Guide. More than 6,500 copies of the guide were mailed to local residents and businesses. The guide is also available for pick up at 50 locations around town. The guide is published twice a year with a spring/summer edition and a fall/winter edition. It serves as the town’s activity guide, with parks and recreation information; a local business directory; a visitor’s guide; and the number one source of local news and events. Stories from the publication may be viewed online at Templeton Community Guide. It’s a great way for local businesses to advertise and reach families and residents in Templeton. The rates are reasonable and advertisers get a 20-percent discount for advertising in both editions. Click here for more information about advertising the Templeton Community Guide. For an extra copy, stop by the Templeton Community Service District office, 420 Crocker St., Templeton, CA, or Templeton Chamber of Commerce office at 321 S Main St, Templeton, CA, or call Access Publishing at (805) 226-9890. Click here for information on advertising online in the Templeton Community Guide.